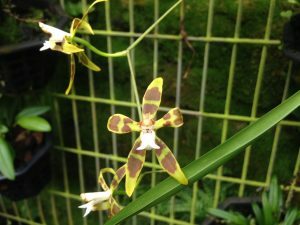 Odontoglossum reversum is a diminutive member of the genus and with us plants grow to 15cm and have short arching flower spikes carrying a few flowers each 4cm across with an interesting white lip with two pointed spikes (presumably part of the pollination adaption) as shown in the side on photo. The species comes from cloud forests from 1500m-3000m altitude in Ecuador and Colombia. 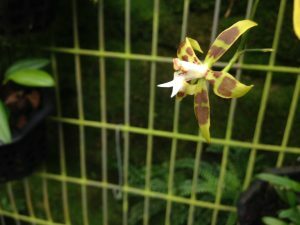 Our clone is from Peruflora.